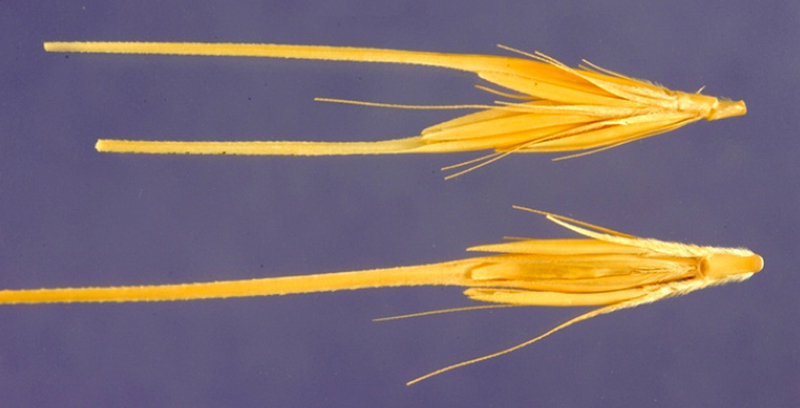 A mutant version of wild barley might offer new hints for making drought-resistant crops. (ISNS) -- A graduate student working in the Judaean desert has discovered a gene that could provide some of the explanation of how water plants colonized dry land. "The Eibil gene is involved in the water-to-land evolution," Chen said. "Many genes are involved. But we do not know how many and what they are. This question is very interesting to be answered after further studies." The first forms of life on Earth were blue-green algae which appeared about 3.5 billion years ago in the oceans. Plants that could produce oxygen through photosynthesis appeared a billion years ago and they produced the oxygen that made the Earth livable but that took hundreds of millions of years. About 600 million years ago, green algae plants with stick-like bodies began to move into the fresh water. They might have evolved onto dry land about 400 million years ago when some of the ponds evaporated. The plants with water-protecting genes would have made the transition easier than those without them. Chen's curiosity was triggered when he discovered a form of wild barley in the desert that was significantly smaller than common wild barley found there. The gene he discovered in 2000 in the smaller cuticle-free plant was partly responsible for the plant's inability to retain water, which would explain why it wasn't doing very well in dry conditions. After earning his doctorate, Chen went to Japan to continue his work and mapped and cloned the Eibil gene there. In the current Proceedings of the National Academy of Sciences, the team reported an alternative form of the gene -- an allele -- that helps the common plant build cutin, the substance secreted from the plant's skin cells. That cutin protects against water loss, something a plant needs if it is going to survive in the air. Rafael Rubio de Casas, a scientist at the National Evolutionary Synthesis Center in Durham, N.C., said the gene could have played a role but it would have been one of many. "Retaining water would be one of the attributes that aided plants in colonizing the land," Rubio de Casas said. "This mutation probably does contribute to the cuticle which may be relevant for water retention, although whether this specific gene was present and with the same function in ancient plants is of course unclear." Barley evolved from a grass and was the first domesticated plant in the Middle East, which helps explain why an ancient form was found in the Judean desert. Writer and scientist Jared Diamond has written in his book "Guns, Germs and Steel" that barley was crucial for the development of agriculture and the rise of civilization. The earliest evidence of domesticated barley is from 8,500 B.C. near the eastern shores of the Mediterranean Sea, and it has also been used to produce beer since the Neolithic Age. According to Nevo, the discovery has ramifications in the fight against hunger since scientists may eventually be able to enhance the ability of barley and wheat to withstand drought, thus increasing crop production.